Application gives you multiple clipboard access. Is there a better alternative to ClipDoubler? Is ClipDoubler really the best app in System category? Will ClipDoubler work good on macOS 10.13.4? ClipDoubler ... Unlike other clipboard enhancement utilities, ClipDoubler is designed as an easy to use application that gives you unlimited clipboards. Double click, and you can have all the clipboards your heart desires. Quit and you're back to one. Simple as that. 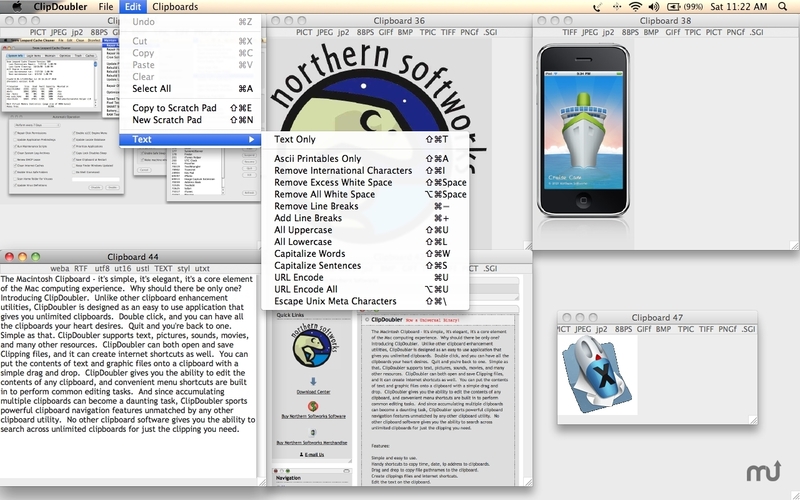 ClipDoubler supports text, pictures, sounds, movies, and many other resources. ClipDoubler can both open and save Clipping files, and it can create Internet shortcuts as well. You can put the contents of TEXT and PICT files onto a clipboard with a simple drag and drop. Version 1.2.3: Release notes were unavailable when this listing was updated. ClipDoubler needs a rating. Be the first to rate this app and get the discussion started! ClipDoubler gives you the ability to edit the contents of any clipboard, and convenient menu shortcuts are built in to perform common editing tasks. And since accumulating multiple clipboards can become a daunting task, ClipDoubler sports powerful clipboard navigation features unmatched by any other clipboard utility. No other clipboard software gives you the ability to search across unlimited clipboards for just the clipping you need.